Did you know? Your slow loading web page can give your users a heart attack and, potentially, kill them? You might not have heard a statement weirder than this but a study into effects of web performance on stress by Ericsson suggests otherwise: “The stress caused by web delays is comparable to watching a horror movie.” Yes, people have had suffered fatal cardiac arrests while watching even mildly intimidating movies like Jaws and Twilight. With DevOps evolving from niche to mainstream strategies in global organizations, the modern CDNs have no choice but to keep up. Nevertheless, there is more to DevOps than faster CDNs and prevention of heart attacks. Before we dig more into DevOps, its implementation, and avenues of business growth, let’s look at how DevOps works. 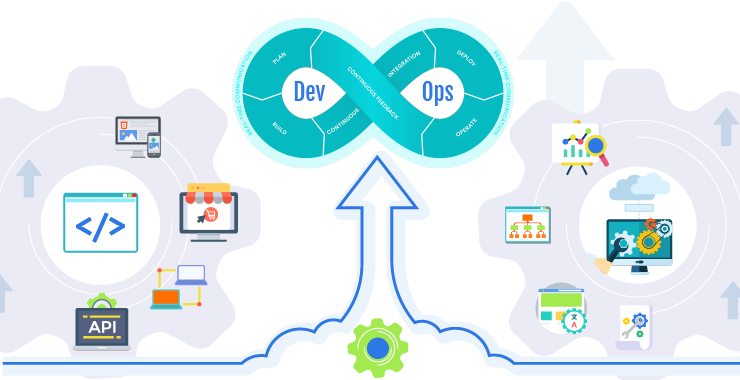 DevOps, as the name sounds, brings two essential part of your IT business operations: Development and Operations into a single umbrella. At times, the single umbrella could be a single team with common goals, a team where software engineers take care of every stage of entire application lifecycle—development, testing, deployment, and, of course, operations. As a result, they develop many skills. Some organizations push their DevOps models to its limits. DevOps models at Airbnb and ByteDance include quality assurance and security teams too, making way for DevSecOps. These teams working together bring many new practices in your business flow to make way for automation. Automation makes way for rapid business growth by cutting manual and slow business processes. 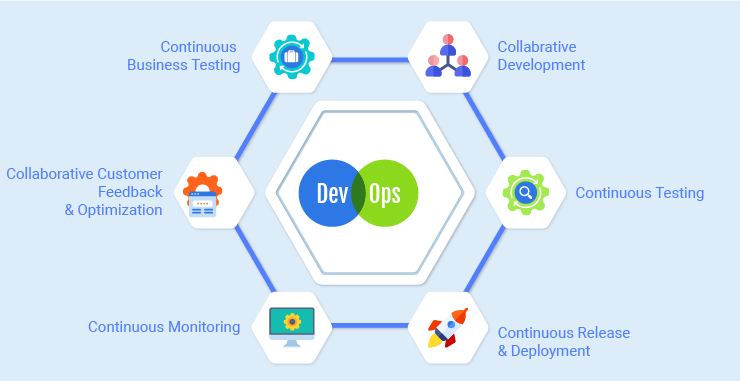 DevOps makes organizations use a technology stack that allow them to operate and evolve applications rapidly and consistently. The technologies also aid engineers individually achieve tasks that generally would have required help from other teams, and this further increases the team’s velocity. However, DevOps in real-world scenarios is much more complicated than simple, aforementioned, definitions. The very first step of DevOps Cycle, continuous business planning revolves around finding potential avenues of growth in your business, pinpointing the skills required, fixing outcomes of decisions and resources required. Collaborative Development involves designing a sketch plan and programming for development to start with. CI is a development practice where software developers regularly merge their code modifications into a central repository, after which automated builds and tests are run. This stage of the DevOps lifecycle increase the efficiency of the organisation by continuously performing unit and integration testing. For an organization to work properly there is a need of constant monitoring. This stage includes monitoring changes and any errors or mistakes whenever it happens. This stage includes monitoring release process and deployment procedures. This stage helps to implement reviews of codes and developers check-ins as well. Feedbacks from customers are an important part of the life cycle, it enables to determine whether your DevOps services are up to mark or not. It helps to take modification decisions. It also allows you to optimize entire process as well. High-performing organizations that commendably utilize DevOps principles run 46x more frequent software deployments than their competitors, 96x faster recovery from failures, 440x faster lead time for changes, Higher levels of customer satisfaction and operational efficiency, 2x as likely as low performers to achieve reported goals across financial and non-financial measures, according to 2018 State of DevOps Report. Implementing DevOps moves your organization at a faster rate so that you bring customer innovations faster, adapt to market conditions better, and raise your efficiency in driving business results. The DevOps model allows your developers and operations teams to work together and accomplish those goals. For instance, microservices and continuous delivery allow teams to takeover possession of services and then issue updates to them faster. DevOps raises the frequency of software releases so that you can transform and improve your product quicker. The faster you can issue new features and security and bug fixes, the sooner you can reply to your customers’ requirements and take a competitive advantage. Continuous integration (CI) and continuous delivery (CD) are DevOps practices that automate the release of software processes, from development to deployment. By implementing DevOps models, you ensure the eminence of application updates and infrastructure vicissitudes, which appreciates rate of deliver to be at a more rapid pace and upholding a positive user experience. Your DevOps team can employ practices like continuous integration (CI) and continuous delivery (CD) to test each amendment for functional integrity and safety procedures. With the right DevOps tools, you can monitor and log practices to stay at the top of performance and leverage on real-time data. If you want to operate your infrastructure and development processes at scale, automation consistency helps you run multifaceted or varying systems resourcefully and with condensed risk. For instance, infrastructure as code supports management of your development, testing, and production settings in a repeatable and well-organized method. If DevOps is a part of your cultural DNA, you can instate operational teams underneath a DevOps cultural model, which accentuates morals such as ownership and culpability. When developers and operations teams work together towards the common goal—delivery, they share accountabilities and syndicate their workflow to streamline business processes. Improved collaboration condenses disorganizations, saves time and money, and accelerates business growth. For instance, reduced period transference between developers and operations and coding are dependent on the run-time environment. DevSecOps is a superset of DevOps and includes security in addition to development and operations. DevSecOps model allows you to move rapidly while keeping control and adhering to compliance and best security practices. You can implement a DevSecOps model without the usual hassles by using automated compliance guidelines, fine-tune controls, and configuration management methods. For instance, using infrastructure and policy–as code, you can state and then track compliance at scale. 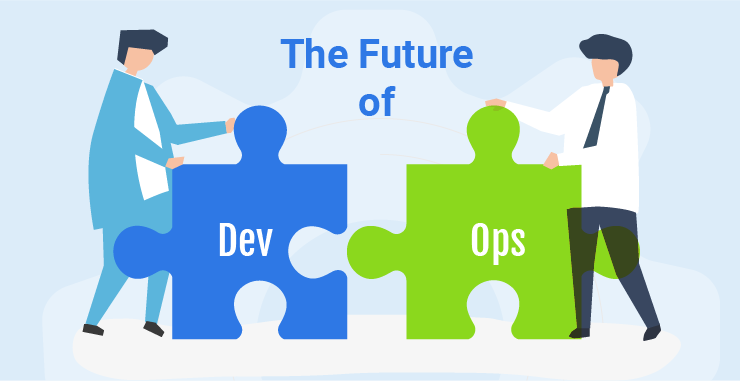 The Future is DevOps, Are You Ready? Software and the Internet have redefined the businesses around us and the industries that run those business; from shopping to show business to finance. Software has moved from a mere business tool to an integral component on which modern businesses run on. Companies communicate with their clientele through software delivered as a service or application on every device they use. In addition, they employ software to appraise operational competences by reinventing every part of the value chain: logistics, communications, or operations. DevOps model relies on effective tooling to help teams rapidly and reliably deploy and innovate solutions for their customers. These tools automate manual tasks, improve our teams’ ability to operate in complex, scalable environments, and keep them in charge of the high velocity that DevOps enable. Every organization is unique and for a majority, the DevOps journey is not straightforward. There are many pauses and commas along the path, which may contain early momentum and lead to chaos. Without a directed path forward, your organizations will struggle to scale their DevOps success beyond isolated teams. Our DevOps team with vast experience will get you back on track and unchain the momentum. DevOps is an everlasting evolution, and it lacks a destination. Nevertheless, we have found ways to achieve success faster and we have identified the six of them.